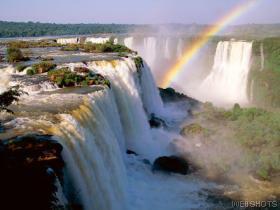 Blog from Iguassu Falls, Brazil | Where is the Love? After almost 2 full days of travelling we have arrived at Iguassu falls. We left Ilha Grande on a boat that almost went on fire. We got the mini bus back to Rio to catch the night bus (15 hours) to Curitiba. The night bus was great though, it was like flying club world (loads of room and almost full beds with foot rests). We got to Curitba on Sunday morning at 8am. There is NOTHING to do in Curitiba, particularly on a Sunday. Nothing was open and it was like a ghost town. No restuarants were open, the only place that had any sort of life was the local shopping mall. We had to have dinner in the food court, while listening to the smurfs singing jingle bells. The next morning we were back on a bus again, only 10 hours this time. We got to Foz and went out to a Brazilian BBQ for dinner. The place must have cooked about 5 whole cows and brought them to us by various cuts on skewers. There was BBQed pork, chicken and pineapple too. One of the specials was chicken heart (which Brian ate). Turkey testicles were also on the menu, however they are only in season from March to Sept (it must be mating season just now!). Brian tried everything on offer and hasn´t needed any food for days since. This morning we set off for Argentina (another stamp in the passport!). The border line was in the middle of the bridge over the river we crossed. We started the day with a jungle walk. No animals to be seen this time. There are lots of different walk ways to various levels of the falls. We went to all the view points. The sound of the water was really load and the spray soaked us. It was really busy with tourists as you would expect. Lots of grannies with elbows shoving us out of the way to get the best view. We were exposed to yet another Brazilian beach fashion sight today. A granny in a knitted bikini wandering about the falls! Very disturbing. The highlight of our day was a speed boat trip along the river and in to the bottom of the falls. We got totally drenched. The speed boat drivers were crazy (just like the bus drivers we´ve had so far) but it was great to get in to the foot of the falls. Tomorrow we are going to Paraguay in the morning (as the falls are on the border of the 3 countries), then to the Brazilian side of the falls. Then at night we are back on a bus (15 hours) to the Bonito. Today we ventured into Paraguay. This was primarily a shopping trip. Due to the lower or no taxes on some goods in Paraguay, particuraly electronics, there was apparently a bargin to be had across the border. The reality was a little dissapointing. The streets were lined with stalls selling all sorts of counterfeit goods from dvds to football shirts, incuding a lot of English ones, no QoS though. The streets seemed a little dodgy, particuraly for white tourists like ourselves so we went into a shopping centre that resembelled the Forge Market. All the goods seemed as knocked off as the Forge as well although the shop assistants in Paraguay were a lot easier to understand! Needless to say we never bought anything and we soon headed back across the "Friendship Bridge" and the Panama River to the Brazilian side of the Iguassu Falls. The Brazilian side sat a little further away from the falls giving great panoramic views of the entire range of waterfalls. The scale is quite something and the noise intense. It was slightly quieter (less people) than the Argentine side as well however not as much to do beyond taking in the view so few hours was enough. We are now waiting to catch a series of buses to Bonito and after 3 transfers should arrive there about 9am tomorrow. Should be safely there for dinner that means. Will update you when we get there.